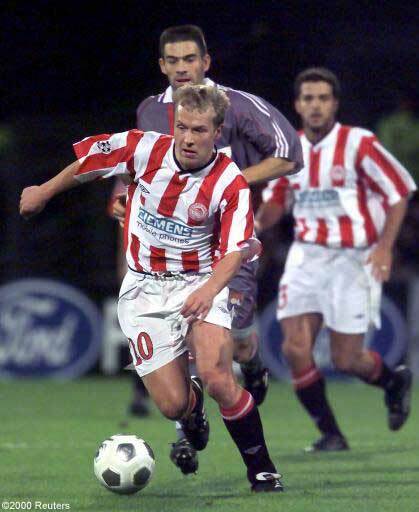 Johan Zetterberg (C) of Olympiakos controls the ball against Pierre Laigle (behind) of Lyon during their Champions League group C match at the Stade Gerland. Olympique Lyonnais coach Jacques Santini was full of praise after his side’s victory over Olympiakos Piraeus FC at the Stade De Gerland in Lyon sent them through to the UEFA Champions League Second Group Stage. Olympique Lyonnais secured the victory they needed when they edged out Olympiakos Piraeus FC 1-0 in their UEFA Champions League First Group Stage encounter at the Stade De Gerland in Lyon.